Store > Horti > Nutes & Pest Ctrl. The below pest control items are about as natural & mild as you can get while still maintaining product effectiveness. We carry a variety of products that cater to both horticultural enthusiasts who grow houseplants (as well as plants for greenhouses, flower gardens, vegetable gardens, and orchidariums), and vivarium enthusiasts who often grow plants specifically for use in vivariums with reptiles or amphibians. Whichever hobby brought you here, we're happy to help your plant hobby grow! NPK ratings provide an easy way to know what kind of formulation you are working with at-a-glance. Here's a quick explanation of the importance of each element in terms of plant development, when working with nutrients. (N) Nitrogen promotes healthy leaves & vegitation, and is considered the most important element for supporting healthy plant growth via formation of proteins within the plant. It supplies plants with the energy necessary for healthy photosynthesis, as it's one of the basic components of chlorophyll. (The compound which plants use to turn light into energy) Nitrogen supports healthy foliar, seed, and fruit production, and helps to speed up general plant growth. (K) Potassium (sometimes referred to as potash) aids in flower/fruit formation, helps plants to grow by activating many different enzymes involved in plant growth, and helps the stomata within the plant process water. Simply put, potassium helps plants utilize water, resist periods of dryness, and adjust to other environmental stresses. 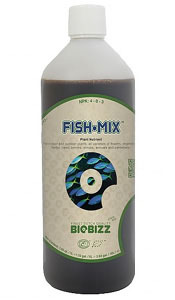 Fish Mix has long been a loyal friend to gardeners, feeding their plants and the soil. The mixture of Dutch sugar beet vinasse and hydrolyzed fish protein provides nutrition for plant growth. A Fish Mix boost provides nutrition to stimulate the growth of microorganisms and useful bacteria in every type of soil and coco based substrates. In keeping with the requirement of organic farming, Fish Mix is not extracted with acids or stabilized with BHT. It is mild enough to be used in the first stages of a plants life or sprayed directly onto leaves during the vegetative stages of growth. 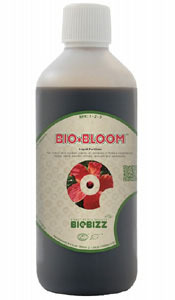 BioBizz Root Juice combines two amazing natural products, premium humic acid and seaweed. It is specially formulated to help promote vigorous root development and stimulate the biological life that surrounds and supports your plant's root system. Root Juice is made entirely from vegetable ingredients and is designed for organic gardening. 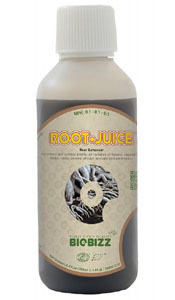 Root Juice is ideal for use in hydroponics systems, peat, and coco mixes. A healthy root system can strengthen your crop's resilience to environmental stresses, especially in the early stages of growth. 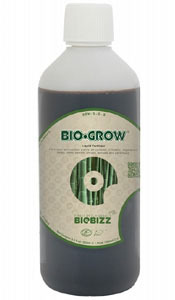 Featuring Biobizz's lineup of nutrients + soil test kit! This organic pest control formula is ideal as a bed bug killer or for virtually all crawling insects. The efficient nature of this organic pest control product makes it the most economical and convenient solution to the wide array of garden annoyances on the market! This product bears the prestigious OMRI-listed seal as well as the USDA National Organic Program compliant for use in organic gardening seal, certifying this product is organic. Diatomaceous Earth (DE) is a dust-like product that contains the crushed fossilized remains of diatoms. The dust is ingested by the bed bug or other crawling insect, or as the insect crosses through the powder, the DE will cut their exoskeleton, causing them to dehydrate and die. Insects cannot develop a resistance to it, since there are no chemicals to which they can build up an immunity. If the area where the Diatomaceous Earth is applied becomes wet, it will need to be reapplied. Diatomaceous Earth is effective as a bed bug killer, flea killer, and crawling insect killer. 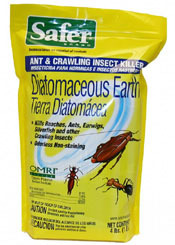 Safer Brand Ant and Crawling Insect Killer Powder with Diatomaceous Earth is made from a patented formula containing amorphous diatomaceous earth, known as silicon dioxide. This particular type of Diatomaceous Earth is derived from fresh water sources and is NOT the same as Diatomite DE which can be derived from unnatural sources and has been linked to cancer. Shop confidently knowing that Safer brand is OMRI listed and is Amorphous Diatomaceous Earth. 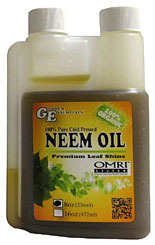 Garden Essential's Neem Oil is the highest grade OMRI-listed Cold-Pressed Neem Oil available on the market! Produced using a cold-extraction process, which, unlike the chemical solvent extraction used by other neem products, retains the highest level of the biologically active beneficial ingredients available on the market today. It's these organic properties of Neem Oil that have been proven effective in the agriculture industry for over 2000 years! Garden Essential's Neem Oil, which comes in an easy-to-use bottle, is most effective when used as a preventative and applied during the vegetative stage every 7-10 days. This preventative application begins to work systemically so that with regular use during the vegetative and early flowering stages, the plants will retain those beneficial compounds through the later stages of flowering without re-application. This means that you can eliminate applying harmful chemicals to your prized crops once flowers appear. Physan 20 is a broad range disinfectant, fungicide, virucide, and algaecide which effectively controls a wide variety of pathogens on hard surfaces and plants. Its applications include greenhouses, hard surfaces, lawn and turfgrass, seedlings and cut flowers, decorative fountains, pools and birdbaths, and plants. An EPA approved concentrate formulated with unique germicidal agents to provide overall protection for your plants and greenhouses. Physan 20 controls disease-spreading organisms which can be carried from plant to plant by using contaminated pots, flats, seed beds, soil, tools and human hands. Keep your plants free of annoying pests with this powerful pesticide-free houseplant insect killer solution. 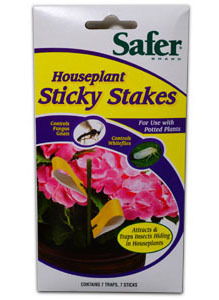 The Houseplant Sticky Stakes are ideal for use indoors or outdoors in potted plants. This trap offers an economical and convenient solution to the annoyances of whiteflies, fungus gnats, blackflies, thrips, fruit flies, midges and other flying insects. Contains no pesticides and is fully disposable. 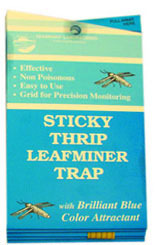 This trap works continuously and provides you with long lasting protection for your houseplants. 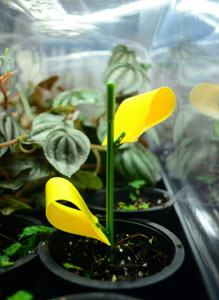 The yellow color of the trap as well as the glue will attract the insects to the potted plants. Stakes are stackable for larger environments. A great choice for 100% chemical free pest protection against fungus gnats in areas growing vivarium-suitable plants, since they fit inside 7" domes comfortably (shown above right). Also can be added to freshly planted vivariums (before inhabitants are 1'st introduced) during the initial cycle stage to prevent fungus gnats from establishing a population. Be sure to remove the sticky stakes when misting, and before 1'st introducing animals! Seabright traps and ribbons use Stikem Special, a non toxic odorless adhesive which is very effective. Millions of these traps have been used by alert greenhouse growers, orchardists, universities and vintners. Easy-to-open 4"x7" trap reverse folds to expose 4"x14" sticky (yellow or blue) surface with grid for precision monitoring purposes. Approximately 30 square inch adhesive area. Non-poisonous and weatherproof. Punched with hole and twist-tie provided to easily hang trap in your growing area. Easy to handle and count insects without getting sticky. Best suited for those growing plants in a greenhouse, shade house, or other mid-level growing operation. Awesome for IDing pests & viewing microfauna up close! Active Eye microscopes use super-bright LED bulbs to illuminate your specimens. 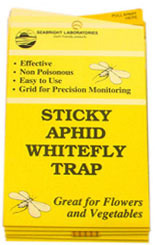 Ideal for identifying strains of plants, cutting work, pests, and disease detection, with no eye strain. The lightweight construction means you can bring the microscope to the garden or anywhere you need extra eye power. Provides targeted, optimal illumination of subject with a compact, lightweight design. 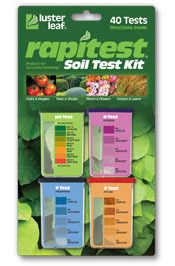 Comes with a full-color chart of the 7 most common pests & diseases horticulturists encounter for easy identification. 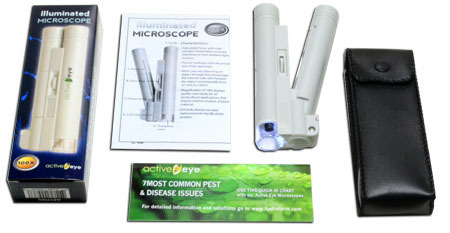 Includes microscope, carrying case, chart, instructions, and batteries.